Scotland’s favorite son, the Bard of Ayrshire and 2009’s awarded Greatest Scot turns 253 years old today. Well…he would…like…if he were still alive and all. 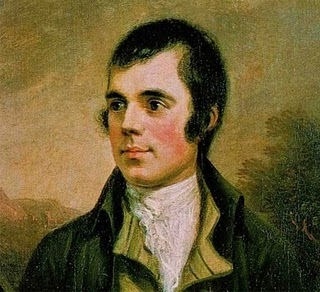 Robert Burns was a self educated man; who collected national songs and wrote both poems and lyric – popularizing his native tongue, Scots language (not to be mistaken for either English or Gaelic). Throughout his life and ever since, he has rightly been hailed as a pioneer of the Romantic Movement and has influenced scores of authors, poets and musicians ever since. Don’t think you know of him? You’re probably wrong! He’s the poet who gifted the world Auld Lang Syne, A Man’s A Man for A’ That and Halloween. Like practically everyone else who grew up in these fair isles; I first encountered Burns in primary school. And, like many, I haven’t really revisited him since…to be remedied this month I swear! O, what a panic is in your little breast! What then? Poor little beast, you must live! Your small house, too, in ruin! Its feeble walls the winds are scattering! Has cost you many a weary nibble! Still you are blest, compared with me!